I was just informed that IN 27 DAYS is going to be translated into SPANISH! A publishing company by the name of Libros De Seda SL in Barcelona has agreed to translate and publish IN 27 DAYS in Spanish within 9 – 24 months! This is so unbelievably exciting, I can’t wait to share more news about this with you all. Posted on October 16, 2017 Leave a comment on IN 27 DAYS…in SPANISH! I am so unbelievably thrilled to announce that just this past week I was made an offer of publication for my second book! As you can imagine, I am absolutely over the moon excited about this, and I can’t wait for you all to read this story. Right now I work as a D/deaf/HOH services specialist at an Independent Living Center, and I also happen to be Hard of Hearing. I started losing my hearing when I was about five, and its declined since then. I wear a neon purple hearing aid, and it’s just the best thing ever. I’ve had the opportunity of working with Deaf consumers of all walks of life and am so overjoyed to be apart of the Deaf community in my area. Telling this story means so much to me, and I am overjoyed to share it with you all. I’m very lucky to be work with Blink YA Books again and their fantastic editorial team, and I can’t wait to see what happens as we start the publishing process with this new story! Stay tuned for more info as it comes along! Posted on September 26, 2017 Leave a comment on Coming 2019…BOOK TWO! It’s been a week since the release of IN 27 DAYS, and I still can’t believe my little book baby is out in the world for everyone to read! A massive thank you to everyone for their amazing support and encouragement throughout this process! 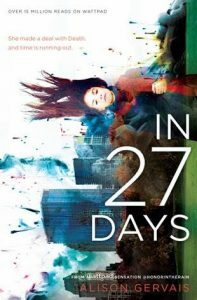 So if you haven’t had the chance to pick up your copy of IN 27 DAYS yet, fear not! A giveaway through Goodreads is now live, available to enter in until August 10! Click on the link below to enter! Posted on August 1, 2017 Leave a comment on Goodreads Giveaway! Posted on July 25, 2017 July 25, 2017 Leave a comment on IT’S RELEASE DAY! Last year I had the honor of participating in the American Foundation for Suicide Prevention’s Out of the Darkness Walk in Denver, and I am very pleased to announce that this year I will be participating again! According to the AFSP, suicide is the 10th leading cause of death in the United States. On average, there are 121 suicides committed each day. And these are just a few unbelievably heartbreaking statistics. Now I will personally admit that I have had an ongoing battle with depression and anxiety and struggled with thoughts of suicide for years, and this is why this is such an important issue that is near and dear to my heart. The story of IN 27 DAYS deals with the heavy issues of suicide and mental health, things that are often wrongfully ignored in today’s society. Taboo topics such as these need to become a normal part of today’s dialogue, and that is why I’m so happy to be apart of AFSP’s Out of the Darkness walk – and you should too! Please click on the link below to be taken to team IN 27 DAYS’ fundraising page to find out more about the AFSP’s Out of the Darkness walk and how you can support this important cause! And, if you feel so inclined, maybe leave a donation as well! Any little bit helps, really! Posted on June 29, 2017 Leave a comment on Pre-Order Bonus Chapter is Ready! Posted on June 5, 2017 Leave a comment on IN 27 DAYS Author Event & Launch Party! I am so very excited to announce that on AUGUST 5, 2017 I will be having my very first signing at Barnes & Noble in Pueblo, CO! Come on down to get your copy of IN 27 DAYS signed! Posted on April 11, 2017 Leave a comment on Barnes & Noble Signing! So there’s been a bit of an oops on my part, and for that I deeply apologize! But firstly, thank you so much to everyone that’s sent in their pre-order information so far! The emails just came pouring in, and I am so excited everyone’s interested in IN 27 DAYS! However it turns out that my publisher, Blink, will actually be the ones sending along the bonus chapter and not me! So hang on to that pre-order snap, and I’ll be posting info on the new email address Blink will be setting up that you can send your snap to in order to get your bonus chapter! I am just so sorry that this mix-up happened! But rest assured, you all will absolutely be getting your bonus chapter asap! Posted on April 10, 2017 Leave a comment on Pre-Order Update! I am so unbelievably excited to share with you all that on July 25, 2017, IN 27 DAYS will finally be hitting the shelves! I know five months or so seems like a long time to wait, but fear not! IN 27 DAYS is available for pre-order! Head over to these following sites to place your order now! Once you’ve pre-ordered, take a screen shot of your pre-order info and hang on to it! Blink will be setting up an email shortly where you can send that snap to get your BONUS CHAPTER! This is something you definitely don’t want to miss out on, so go pre-order now! Format ImagePosted on March 1, 2017 April 10, 2017 Leave a comment on Pre-order IN 27 DAYS!